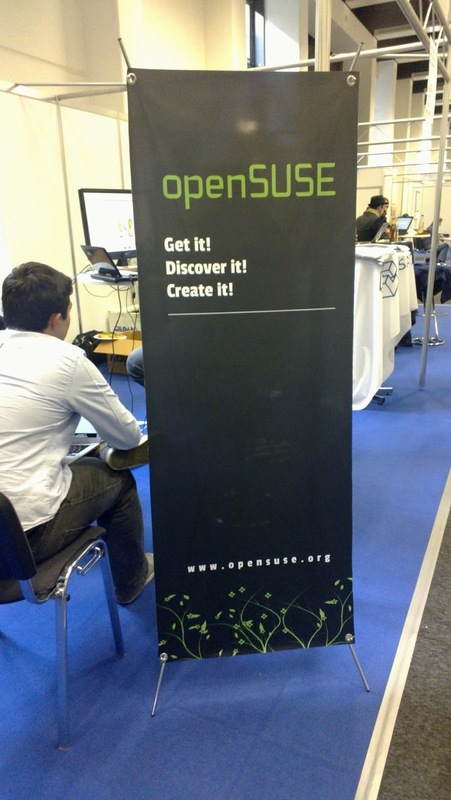 As I wrote last week, openSUSE was at Linuxtag. We didn't have a huge team like last year, nor did we bring all the beer - but we had some fun nonetheless. 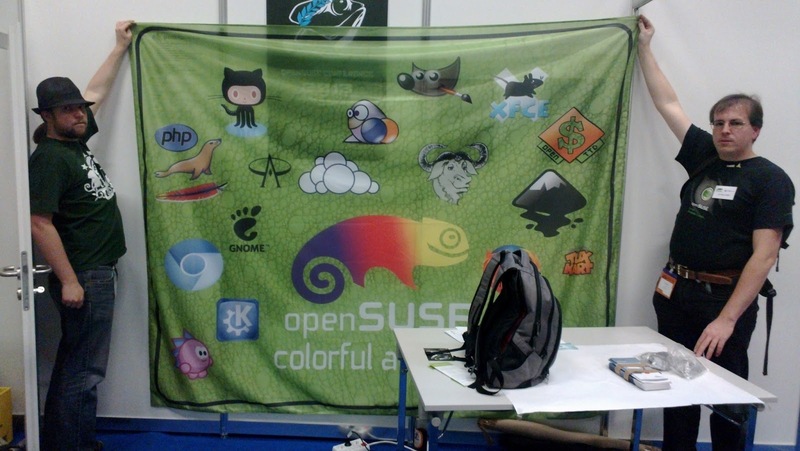 For me, the most awesome thing was the openSUSE Jeopardy done by Christan Boltz, it was SUPER cool. Of course, part of that was because I won, mainly due to the quotes section - my fellow participants had no idea who wrote them. I even recognized my own quote and it looks like I still can agree with myself. Must say that the Jeopardy thing was really, really fun. 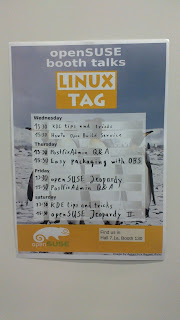 For those wondering what the heck I'm talking about: we have small booth talks at our booth at LinuxTag. I believe Henne Vogelsang once started doing this (even before I joined openSUSE), teaching people how to fold paper Geekos and stuff like that. I'm not that creative, so I only gave KDE tips and Tricks on Wednesday and Saturday. Strange enough, nobody even seemed to have noticed that I gave that session in my favorite GNOME shirt... Luckily Christian had a way better idea for these booth talks: Jeopardy! Bernhard Wiedemann also joined the booth team, I even have to say he formed the core of it, being the most steady force as Christian didn't make it on Wednesday and I wasn't there on Thursday and Friday. 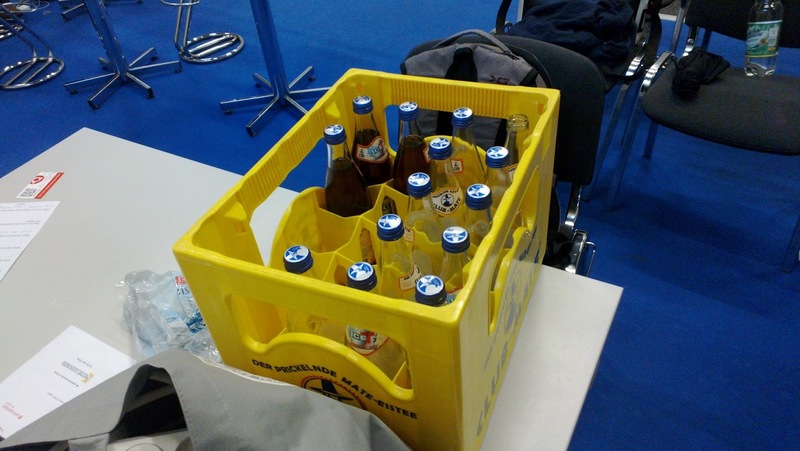 He talked about OBS packaging which also attracted people interested in packaging. 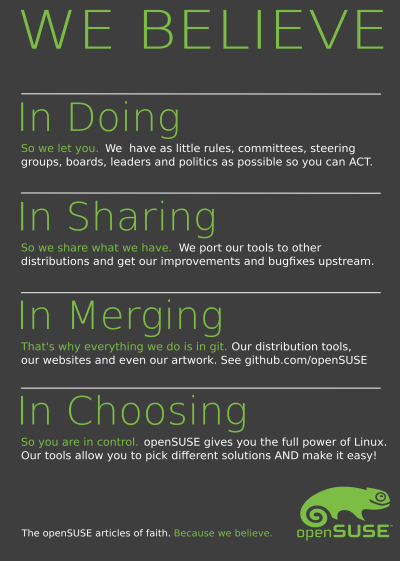 We had no beer this year but openSUSE Conference flyers and posters as well as a batch of 500 openSUSE flyers based on a design we've been working on in the last 2 years (until now they were only printed in the US). It seems not too many are interested in going to Greece (can't imagine why) but it was still good to point the existence of the conference out to people. 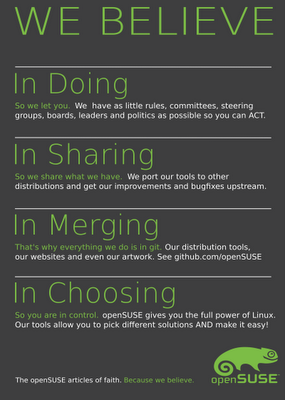 For the openSUSE flyer I had the explicit goal of seeing if it could help kickstart a conversation. I am not sure if that really works, but of course our booth team was so experienced they don't really need talking points. Also, if you visited our booth and are reading this - I would love feedback, both good and bad. On the looks of it, the posters, flyers, DVD, people - all of it! We also had a few 'big' (as in, not at the booth) talks. Bernhard and Sascha spoke about OpenStack / SUSE Cloud / crowbar in the main track and I myself talked for about 30 min on what happened to openSUSE in the last year and gave a 2 minute lightning talk about our booth as well. 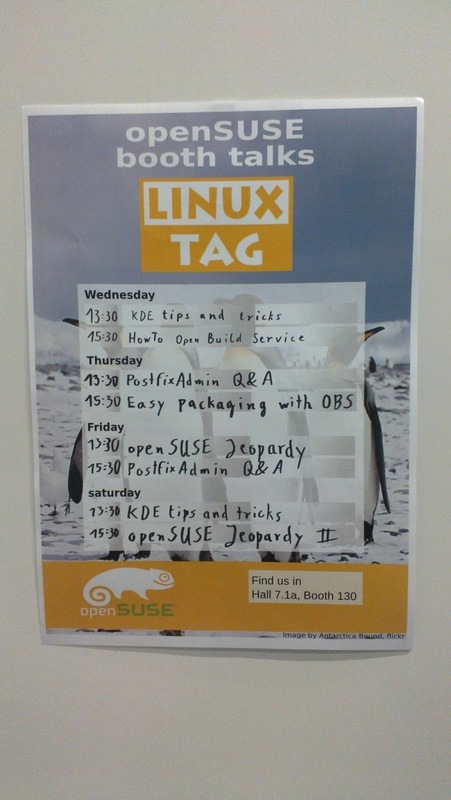 All talks went well but LinuxTag isn't the most crowded event and seems to be getting smaller - talking for 20 people is perhaps more fun as you get to have more close contact to the audience but it's hardly worth traveling for. 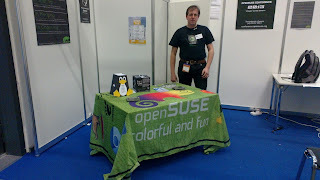 The booth talks I gave about 'advanced KDE usage' where big fun. They usually had just a handful of visitors which meant we all sat together around my laptop and could discuss things quite nicely. Fun!